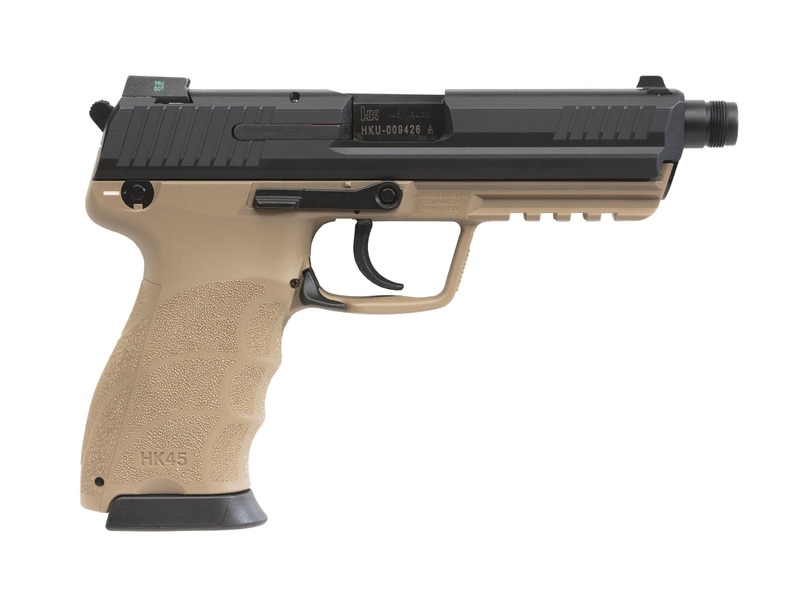 Originally developed for the U.S. military's next generation handgun competition, the new HK45 "Tactical" comes standard with a threaded barrel and three-dot tritium night sights. 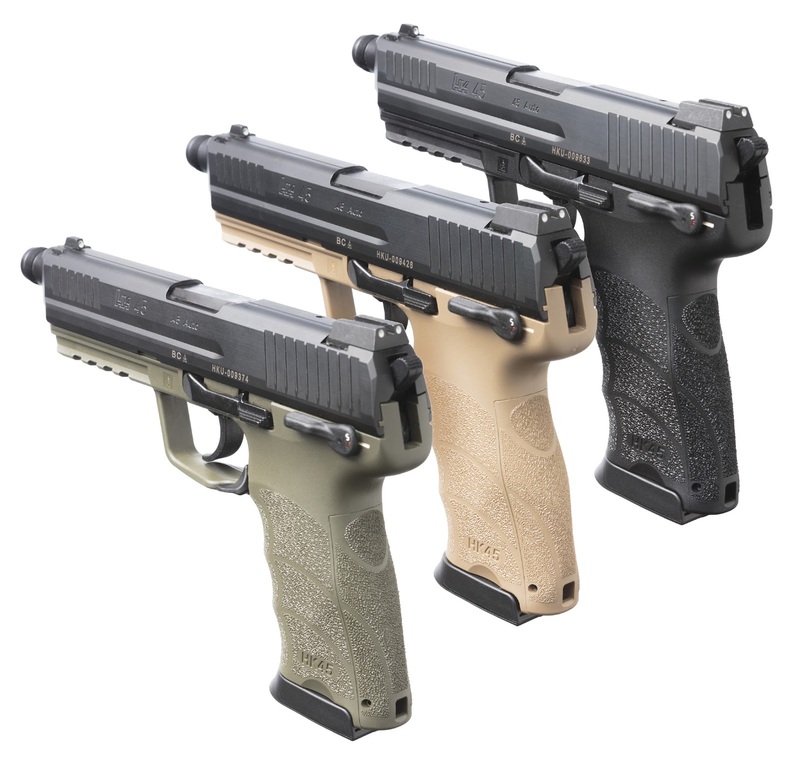 With a choice of three frame colors (black, tan, or green), the full-size HK45 Tactical (HK45T) model uses an ergonomic grip design that includes changeable backstraps together with molded finger grooves for optimum shooting. 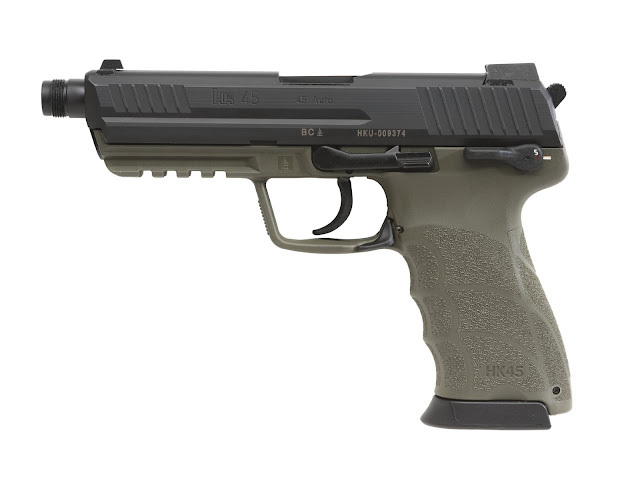 And like all HK45 pistols (compact, full-size, Tactical models), they're made at HK's American manufacturing facility using American and German components. The HK45 Tactical has a proprietary internal mechanical recoil reduction system that employs a flat recoil spring in tandem with a polymer bushing sleeve to reduce the recoil forces effecting the operator and the weapon, improving shooter control during rapid firing and prolonging component service life. An "O-ring" on the threaded barrel means better slide-to-barrel lockup and enhanced accuracy. 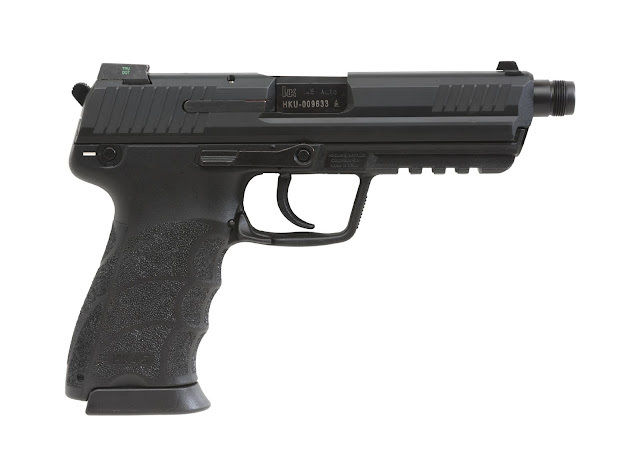 The HK45T can be converted to nine different kinds of trigger firing modes including HK's enhanced double action only "LEM" (Law Enforcement Modification) mode. The HK45T is well suited for military, law enforcement, security use, and civilian sport shooting. Just read your article. Good one. I liked it. Keep going. you are a best writer your site is very useful and informative thanks for sharing! Go for the best quality product possible and research before purchasing one. Wasting money is not something anyone likes, better spend sometimes on research and get the right best small Tactical Backpack. When I was looking for the best gun mounts, I came to know about ‘DDG Tactical’ one of the most prestigious sellers of tactical weapons and gear. Thank you sharing this post... It was my first major pistol purchase and it looked great before I got it, but I just cant seem to get why its shots are so inconsistent.For more info Zoomtargets about pistol shops..